Rahul Dravid has two kinds of fans. The ones that think he’s cute and intense (mostly women) and the other who think he’s sturdy and reliable (old school cricket fans). And it is this vast list of devoted followers that explain the off field career of an Indian batsman known as The Great Wall of India. 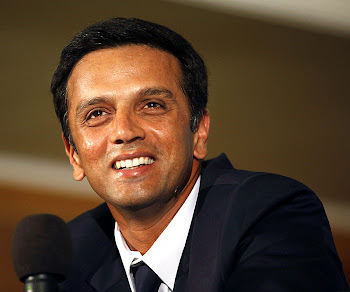 There are precious few young followers of the game who revere Dravid. They respect him, they may even like him (there’s very little to dislike about him), but are they likely to sit in the sun for three hours to watch him score a hundred? I sincerely doubt it. For he is not swashbuckling, he’s not grand, he’s not glam. But he’s one of the batting greats of world cricket today and mark my words, will go down as one of the greats of all time. He will also be known as the player who never got his due. One who sacrificed entertainment at the alter of team spirit. The one man, in a band of seemingly selfish individuals, who cared for team records over his own. He pleases the eye, but will he make your heart rate fluctuate like the Sensex on election result day? Not likely. He’s correct. In technique, in choosing the right shot, in choosing the right words. And that’s where lies the problem. The problem is his near perfection. The youth of India are not fans of perfection. Our poster boys are slightly bad, they’re a tad controversial, and they’re in trouble now and then. For picking the wrong ball to hit, the wrong girl to date, and the wrong words to speak to when the Australians are up their backs. Even a Sachin is prone to fiddling outside the off stump early in the innings. Ask any bowler and he will tell you that all the greats will give you a half chance early in their innings, except Dravid. From the time he puts on that helmet, you know that you will have to sweat and toil for his wicket. You will have to outthink him, con him, get him with an inspirational burst of sheer genius. He will not just hand it to you. He’s not tempted by the glory of a few quick boundaries, or the dance down the wicket for the big six. He’s patient, and he wants the team to win, whether he needs to get a dozen or a ton. And in a culture of instant consumption, one that India has seemed to embrace whole heartedly, this rates as boring. Hence you don’t find him selling too many things on your idiot box, because advertising in our country is targeted toward the youth. He’s sold the odd cola, but in a crowd. He’s also sold car batteries and multiplugs (or was it trip switches) a product list as appealing as Barbara Streisand in hot pants straddling a wooden buck horse. And lets not even start on the way our very own board has treated him. They made him captain when no one wanted the job. They made him wicketkeeper when they couldn’t nurture all-rounders. They picked him for the one dayers last summer, and dropped him after an impressive series. Only because they wanted to groom a team for tomorrow. But does all that bring him down? Answer yet again, my friends, is no. In fact this appears, oddly enough, to motivate him even more, to perform better. He was dropped from the ODI team early in his career, but he clawed his way back in. Then rather unceremoniously he was dropped again. Agreed he had a bad inaugural Indian Premier League but so did a lot of others. Afridi, Gibbs, Kallis, Ganguly, Ponting. It was no surprise that he was dropped as captain for IPL 2, and what did he do? He showed from the first game that he wasn’t a pipe smoking old timer in the T20s. His man of the match performance against the defending champions showed that he wasn’t rocking chair material, instead was rock star material! Just sans the ‘image’. The only people who seemed to have realized his true legend status have been the good folk at that razor blade making company. By making him stand next to Tiger Woods, Thierry Henry and Roger Federer they have in one mach stroke confirmed that he’s not just one of the greatest batsman India has produced, but one of the true greats of the game. Ok, maybe Henry’s a bit of a stretch, but Dravid isn’t. Former captain of India Saurav Ganguly will vouch for the team player that Rahul is. India’s most ‘successful captain’ couldn’t have done it without his ‘Wall’. Of the 49 tests Sourav lead in, Dravid played in all, scoring almost 5,000 runs at an average of over 73. In the same period Sachin was averaging the early 60s and Laxman and Sehwag in the early 40s. Factor in that Ganguly himself averaged fewer than 40 per match and its clear to see who was the biggest contributor in one of the most successful phases of Indian test cricket in recent memory. The sad thing is that we will be seeing even less and less of Rahul Dravid in 2010. He’ll have his few games in the IPL. But besides that we have the opportunity to see him in two current tests matches versus Bangladesh. And then we wont see him put on his India hat another test for another six months. Will he be hopping the bus for the World Cup in 2011? I doubt it. Last week Rahul Dravid fractured his jaw playing for his team, and in a boring old test against Bangladesh. He was batting at 111. A Nelson. If that's not bad luck I don't know what is. Call this my premptive farewell piece to one of my favorite batsmen of all time. Rahul Dravid may not have been a treat on the eyes like a Hayden or a Gilly. But one look at him walking to the centre was enough to warm the toggles. You knew that the country was in safe hands.